Smurfs began with a simple sketch by Belgian illustrator Pierre Culliford. According to the legend, Smurfs are blue elf like creatures standing three apples tall that live in the forest. Characters such as Jokey Smurf, Greedy and Brainy were all part of the clan that took advice from the wise Papa Smurf. Most of the group were captivated by the only woman in the clan – Smurfette. According to the Mental Floss Blog, Culliford, a Belgian artist known as Peyo, was having dinner with a friend and experienced a momentary brain freeze and could not remember the word for so, finally asking his friend to pass the “schtroumpf.” His friend, quite amused, replied, “Here’s the schtroumpf. When you are done schtroumpfing, schtroumpf it back.” Cuilliford would take the amusing moment and turned it into a comic strip called “les Schtroumpfs.” Les Schtroumpfs would be renamed the Smurfs when they eventaully burst onto the scene in the United States..
Smurf-mania hit Europe – sending England, France and Italy into a merchandising frenzy. 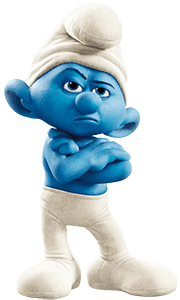 In the States, Stuart R. Ross and Wallace Berrie bought the rights to merchandise Smurfs in the U.S. These blue elves outsold merchandise from Star Wars, Garfield, Snoopy, Annie, and Mickey Mouse. Their popularity grew even more when NBC President and CEO watched his daughter play enthusiastically with her smurf doll and he decided to make a cartoon series based on the characters. The series would run for nine seasons. Like most merchandising frenzies, people quickly became smurfed-out in 1982.